You are about to embark on the most intellectually challenging, and the most rewarding, educational experience of your life. The knowledge and skills you gain over the next three years will form the foundation of your legal career. By joining us as a student at KU Law, you can ensure that the foundation you build will support your professional goals, whatever they may be. As a KU Law student, you become a part of a proud history. The University of Kansas was established by a determined group of abolitionists with the personal courage and integrity to take a stand against slavery. They envisioned a free state in which every citizen would have legal rights and the protection of the law. When you walk around Green Hall, you will see composite photographs of generations of law students. From the earliest classes, those pictures include the faces of students of color and women. KU Law is, as it always has been, an inclusive and welcoming place. You will find the learning environment at KU Law to be challenging, yet collegial. Your classmates will include students from across the country and around the world. The diversity of the student body’s backgrounds and opinions creates a rich classroom environment. That environment is supported by faculty members who are outstanding lawyers and who are known, nationally and internationally, as outstanding scholars in their fields. What makes the learning environment at KU Law unique, however, are the relationships between the students and the faculty. Unlike the faculty at many law schools, KU Law professors are open and accessible to students – and truly committed to teaching, both in and out of the classroom. 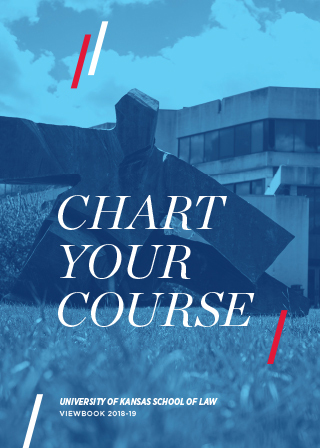 As a KU Law student, you can select courses from a broad and varied curriculum and participate in a wide array of extracurricular learning opportunities. You can pursue a general legal education or specialize through one of our eight certificate programs. We have 11 joint-degree programs, all of which allow you to obtain both a J.D. and master’s degree on an accelerated basis. You will find the experiential learning opportunities at KU Law are more extensive than at most other law schools. These programs allow you to begin your legal training by prosecuting criminals or representing inmates, serving in a judge’s chambers or providing legal services to the poor. You can also participate in crafting legislation through the Legislative Field Placement Program or the Public Policy Practicum. Best of all, you can take advantage of all the educational opportunities at KU Law for less than one-third the cost of a comparable private school. With a law degree from KU, you become a part of an alumni network that includes graduates practicing in law firms that range in size from over a thousand lawyers in a single firm to just two or three lawyers. Instead of practicing in private firms, many of our graduates act as corporate counsel, advising business leaders, and as chief executive officers, helping run businesses both large and small. They are state and federal judges, appointed officials, elected leaders and law professors. They can be found in the halls of Congress, on Indian reservations, in law schools, law offices and government buildings in every state in the nation and in countries around the world. When you complete your legal education and take your own place as a member of the bar — whether your place is in the courtroom, the boardroom or the classroom, on the bench or in the statehouse — KU lawyers will be there to welcome you. Make a wise choice: Join KU.